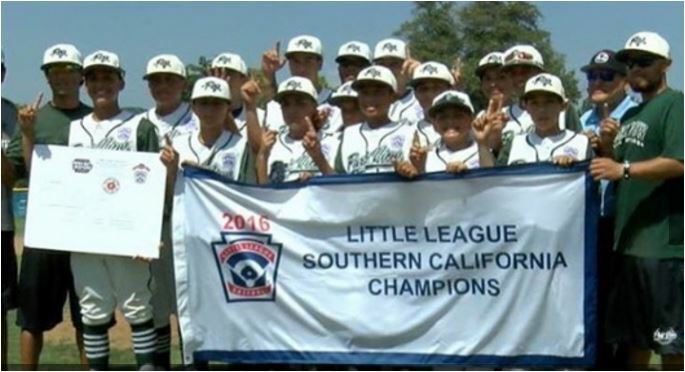 The all-star team from the Chula Vista-based Park View Little League was eliminated from the Little League World Series Tuesday night with a 4-2 extra-inning loss to its counterpart from the Goodlettsville Baseball Little League from Tennessee. Park View had a chance to win the game in regulation, but Adriel Colmenero was thrown out trying to score from second on an error with two outs in the bottom of the sixth, forcing extra innings. Tyler Jones homered leading off the seventh inning to break the tie and Goodlettsville combined a hit batter, two singles and a walk for an insurance run. Park View had runners on first and second with one out in the bottom of the seventh, but cleanup hitter Daniel Leon grounded into a game-ending double play before a crowd announced at 7,119 at Howard J. Lamade Stadium in South Williamsport, Pennsylvania. Park View tied the score in the fifth on Lucas Marrujo’s two-run homer in the fifth. Goodlettsville, the Southeast Region champion, opened the scoring in the second inning of the elimination game. John Henry Knotts reached first with two outs on catcher’s interference and moved to second on Ryan Oden’s single. Brock Duffer was hit by a pitch to load the bases. Jon Luke Simmons walked to force in Knotts. Zach McWilliams’ two-out homer in the fifth increased Goodlettsville’s lead to 2-0. Oden, the second of three Goodlettsville pitchers, was credited with the victory, allowing one run and four hits over two innings, striking out three. Robert Carroll relieved Oden with one out in the seventh and was credited with the save. JonLuke Hobdy, who took the mound to start the top of the seventh for Park View, was charged with the loss. Marrujo struck out seven in four innings of relief. A loss in its opening game of the World Series Friday put Park View in a must-win situation in the modified double-elimination tournament. Park View was able to avoid elimination Saturday with a 5-0 victory over the all-star team from San Antonio, Texas’ McAllister Park American Little League, the Southwest Region champion. Today’s game was the first for Park View, the West Region champion, since then as rain Sunday forced suspension of play and the rescheduling of games originally planned for Sunday and Monday.